What If the Dead Could Come Back? Each poem in the Lessons of the Dead starts with that premise, and the results are funny, imaginative, and often strange: The road back to life is long, winding and lined with truck stops and waiting rooms, but it is also chockfull of hope and humor and beauty. By definition, the cast of characters includes almost everyone: from Adam and Eve and archangels to Houdini, Rameses II, and Death himself. Along the way, readers encounter the Titanic, the Permian-Triassic Extinction, the Heroic Age of Exploration, even the ubiquitous mall maps that say You are here. 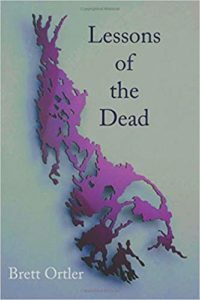 Part memento mori and part the opposite—a total embrace of life itself—The Lessons of the Dead is likely different from any other poetry book you’ve ever read.